Roses have a bad reputation as fussy, fragile plants. Most are not. Some, like shrub roses and rugosas, are actually pretty tough cookies. However, like any plant, they have their preferences and the better able you are to provide them, the better your roses will do. 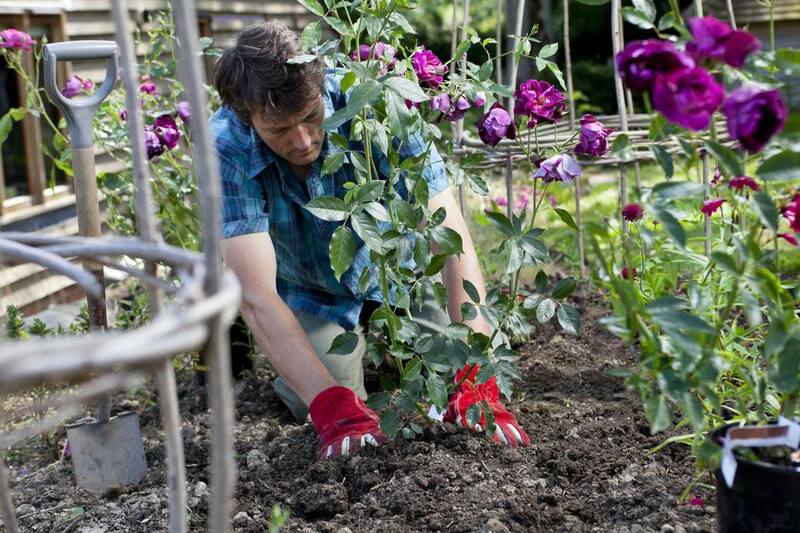 Here are some guidelines for preparing soil for planting roses. The pH of the soil will affect how well your roses can access nutrients in the soil, so it's worth paying attention to. If the pH is way off, it won't matter how much you pamper your roses, they will still be stressed. Luckily roses prefer a soil pH in the neutral range. A measure between 6.0 - 7.0 would be ideal. It is easiest to amend the soil before planting, but you can make adjustments afterward. If your soil is extremely alkaline or acidic, you might want to consider replacing it or growing your roses in containers, because adjusting soil pH is not a one time fix. Roses need a soil that drains well but holds onto moisture long enough for the roots to absorb some. That means loam. Too much clay and the roots can become waterlogged. On the other hand, a sandy soil will drain before the roots can get a good drink. If you are not starting out with a loose, loamy soil, you will need to do some amending. To begin, remove any large rocks and stones from the planting site. Don't be tempted to add sand to clay, or vice versa, to try and balance things out. Instead of correcting the problem, you will simply be making cement. The key ingredient in making bad soil more friable is organic matter in the form of something like compost, composted manure, or leaf mold. Organic matter will aid in both water retention and drainage and it loosens the soil texture, as it decomposes. Many gardeners like to add additional amendments to the soil at planting time. It's impossible to give specific guidelines on how to enrich the soil for roses - or any plant - because soils vary so greatly. You could have your soil tested or you could take your cue from plants growing nearby. If the other plants in the area are lush, green and free flowering, your soil is probably in good shape. If they are continually stressed, yellowing, or afflicted with problems, you need to add some nutrients to the soil. Rather than getting caught in a cycle of fertilizer dependency, feed the soil and let the soil feed the plants. It's not just healthier for the plants, it is less work for you. While we can't give you specific recommendations for your particular soil, we do recommend adding some phosphorous, which helps plants develop strong roots and become well established quickly. Phosphorous or bonemeal are widely available. Mix about 1/2 to 1 cup per bush throughout the soil, before planting. Some gardeners like to add kelp or soy meal for added nitrogen, but if you have added organic matter you probably have enough for now. Epsom salts are also in many rosarians' bag of tricks. These add sulfur and magnesium, two elements crucial to healthy plant growth. You can either mix 1/2 cup into the soil or dissolve the 1/2 cup of salts in water and sprinkle around the rose bush. Use caution around the leaves. Any type of salt can burn leaves if used on hot, sunny days. Once you have the perfect soil for your rose bush and it is settled into the planting hole, you will want to add a 2- to 3-inch layer of organic mulch to the surface of the soil. Mulch will suppress weeds, keep the roots cool and help the soil retain moisture. Opt for an organic mulch that will slowly break down and continue to feed the soil and improve the soil's texture. Good choices include shredded bark, leaf mold, and good compost. Spread the mulch all around the root zone of the rose bush, but keep it 2 to 3 inches away from the stem. Piling mulch against the stem can lead to rotting and can provide cover for gnawing rodents and insect pests. It can take some time and effort but getting your roses started off in well-prepared soil will help them get established more quickly, grow healthy, and have fewer ​problems down the line.